Watercolour drawing with pencil and ink of the palace at Bhaktapur in Nepal, part of the Lawrence collection created by an anonymous artist, c. 1843-1846. The image is set within a broad black frame and is inscribed on the front in pencil: 'No. 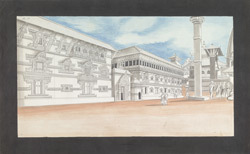 10'; and on the reverse: 'Palace at Bhatgaon.'. Bhaktapur, the 'City of Devotees' is 11 km east of Kathmandu and 10 km north-east of Patan and is the youngest of the three former city-states of the Kathmandu Valley. Bhaktapur was founded in the 9th century and rose to prominence under the Malla dynasty. It remained a valley kingdom until the late 15th century when it became a sovereign state, together with Kathmandu and Patan. All three have similar architecture and were built around Durbar Squares containing Palace and Temple complexes. This view shows the palace at Bhaktapur, the Golden Gate and various temples and pillars in the Durbar Square.